The City of Springfield, Massachusetts has two official symbols, and is also often represented by depictions of the Municipal Group as a de facto emblem of its government. A. Such flag shall have an inner blue field bordered with gold and set in an outer white field. B. In the center of the blue field, on both the front and reverse thereof, shall be a white shield bordered with gold. C. Arched above the shield and set in the blue field shall be a scroll in gold bearing the inscription "Springfield." D. Upon the seal shall be a likeness in gold of the St. Gaudens statue of Deacon Samuel Chapin. E. Within the shield and below on both sides flanking said likeness shall be a scroll in gold bearing the inscription "A Town May 14, 1636 O.S. Organized A City May 25, 1852," all in substantial conformity with the design executed by Charles H. Restall and filed in the office of the City Clerk. The Puritan statue in itself could be considered a symbol of Springfield; the flag appears in the city council chambers to the right of a portrait of the same. Because the city code neglects to mention specific standards for the flag's measurements, several variations of both the statue's rendering, as well as differing proportions for the flag have appeared since its adoption, including a gold border outer border not described in the code which can be seen in the examples below. An early example of the flag, printed in a book on Samuel Chapin's genealogy; note the lack of gold shading on the banner and statue, wider white field and golden fringe. The flag as it appears in the Massachusetts State House Hall of Flags; containing an unusual rendition of The Puritan statue and bearing a different shield and proportions from the previous example. "No. 29. An Ordinance to Establish a City Seal. 1. Description of the seal. Section 1. The design hereto annexed, as executed by Richard Paine, giving a view of the city, shall be the device of the city seal, the inscription being as follows, to wit : 'Springfield, organized a town May 14, 1636, O. S., a city, May 26, 1852." Whereas the city ordinance describes a seal produced by engraver Richard Paine, the rendition from which the modern depiction is derived from was carved by engraver Thomas Chubbuck. The seal contains a number of scenes of Springfield's historic buildings. In its crest is a picture of the Springfield Armory's arsenal building with the American flag. Below this crest sits a shield with an embellished trim and an arrow running through it from east to west. From the top, clockwise, the first scene shows a train leaving the city's first Union Station, crossing the former North End Bridge over the Connecticut River; the house on the lower right is the "Old Fort", the residence of John Pychon, built on the homestead of his father William Pynchon. Erected in 1660, it was the first brick building in the settlement, and served as a safehouse during the siege on Springfield during King Philip's War, and remained on the corner of what is now Fort Street, presently the Student Prince/Fort Restaurant, until 1831 when it was razed for new construction. The scene on the lower left shows three smaller buildings and two steamboats on river; prior to the construction of Interstate 91, the Connecticut River played a more significant role in the livelihood of the city. The arsenal building of the Springfield Armory museum and historical site. The former North End Bridge and the old Union Station, both of which appear on the upper half of the seal shield. The John Pynchon homestead, also known as the "Old Fort", drawn by Rev'd William Bourne Oliver Peabody. The ferry "Agawam", crossing the Connecticut River to Springfield. An unofficial example of the coat of arms of the seal, printed in an early 20th-century Springfield history book. Often used in the city's press releases, civil patches, and official letterhead, is the Springfield Municipal Group: the group of Neoclassical buildings comprising City Hall, the campanile, and Symphony Hall. 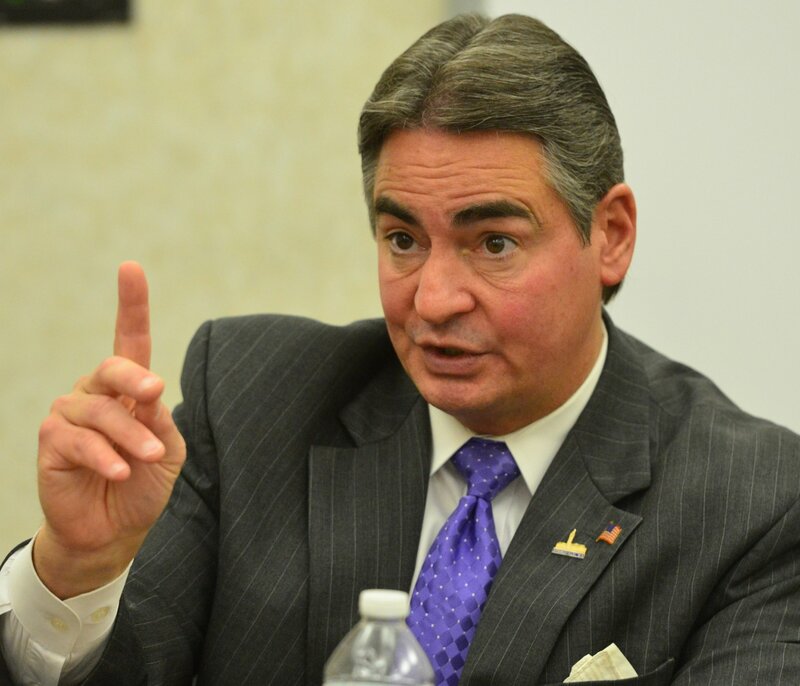 In addition to its clerical use the symbol is also adorned by the city mayor, Domenic Sarno, who can often be seen wearing a Municipal Group lapel pin in tandem with one of the American flag. Patch of the Springfield Police Department. Patch of the Springfield Fire Department. Official letterhead of the city in a letter from former Mayor Theodore Dimauro. ^ Chapin, Gilbert W. (1924). The Chapin Book of Genealogical Data With Brief Biographical Sketches Of the Descendants of Deacon Samuel Chapin. I. Hartford: The Chapin Family Association. ^ a b "City of Springfield, MA Seal and Flag". eCode 360. Archived from the original on 10 March 2016. Retrieved 13 May 2017. ^ Matt Szafranski (19 May 2015). "[Image from] Take My Council, Please: Thrown under the School Bus Funding". Western Mass Politics & Insight. WordPress. Archived from the original on 23 May 2015. Retrieved 13 May 2017. ^ King, Moses, ed. (1884). King's Handbook of Springfield Massachusetts. Springfield, MA: James D. Gill, Publisher. pp. 15–16. ^ A Half Century's History of the Springfield Fire and Marine Insurance Company. Springfield, MA: The F. A. Bassette Company. 1901. pp. 28–29. ^ Verel, Amy C. (December 2009), Reclaiming the Miracle Mile: A Greenway Park Design & Land Use Strategy for Springfield's Lower Mill River, Landscape Architecture & Regional Planning Masters Projects. Paper 8. University of Massachusetts Amherst. ^ "[File Photo of Domenic Sarno]". MassLive. Archived from the original on 14 May 2017. Retrieved 13 May 2017.